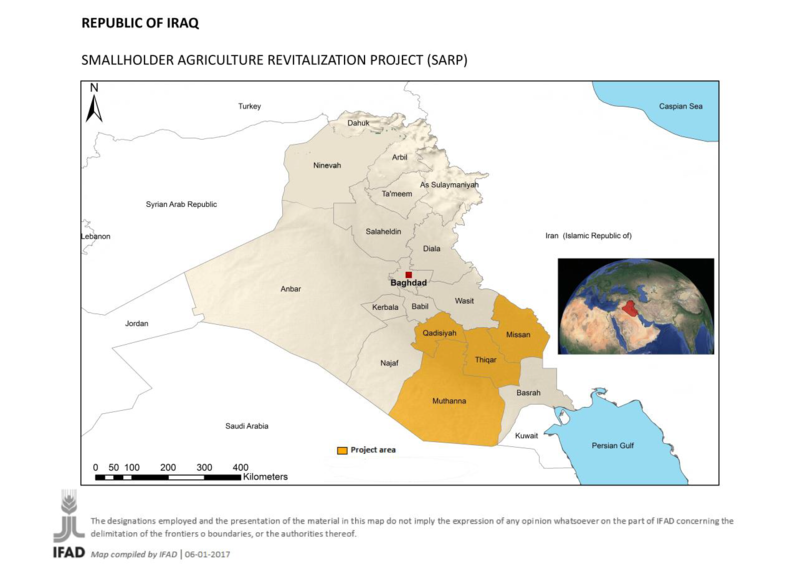 The agricultural sector in Iraq is highly vulnerable to climate change impacts. Climate change is already showing major impacts in terms of water scarcity and soil salinization, with increased vulnerability of poor rural communities. The predicted future climate conditions will significantly reduce water availability in the spring/summer periods critical for crop production, causing marked reduction in runoff relative to input precipitation, increased evapotranspiration, and decreased soil moisture, and increased soil salinity risk. The project objective is to strengthen the agro-ecological and social resilience to climate change in the four target governorates (Muthanna, Qadisiya, Missan and Thi Qar), by enhancing water availability and use efficiency, and promoting adaptive agriculture production systems and technologies for improved livelihoods and food security of rural households. The project is designed to deal with one of the major constraints in the country that centres around the growing scarcity of irrigation water and to assist the country with strengthening its capacity at the national level for monitoring climate change patterns and providing relevant information to key stakeholders and farmers to enable them to undertake adaptation and risk mitigation measures through an early warning system.